Kanga Care Cloth Diapers: Cloth diapering on the road?! It's possible. Here's how! Can we give this Daddy a high five?! Cloth diapering on the road?! It's possible. Here's how! Pocket diapers are great for everyday use and are perhaps the most popular type of modern cloth diapers, but remember, they tend to be bulky and take up a lot of space! If you are flying, most air carriers now charge a (large) fee for checked luggage. Save yourself some luggage space and money. Pack about 16-20 covers, split them up evenly between your carry-on luggage and your checked bag, that way, if your luggage gets lost you can still have a small stash to take with you. Diaper covers also can be used multiple times. You can reuse the cover as long as no poop gets on it and you wipe it down before placing a clean insert over it. 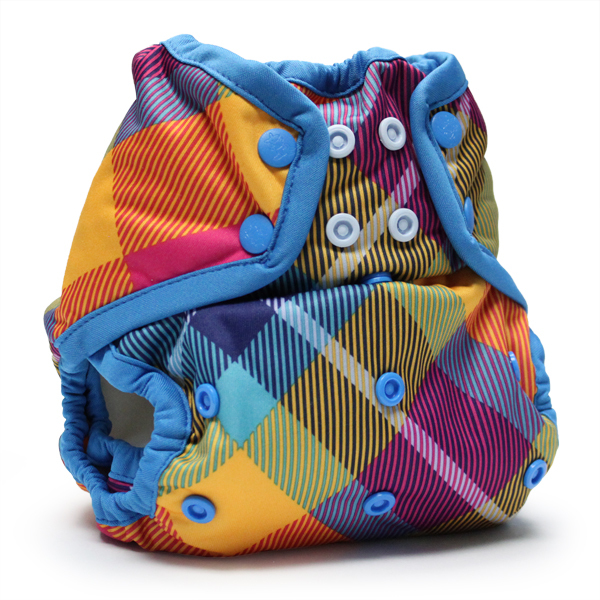 What we love: Rumparooz newborn or one-size aplix diaper cover. These covers are the best! They have an extra layer of protection with the double gussets and are so easy to use. These take almost no space at all in your suitcase-they are so trim! Good ol' thirsty bamboo inserts are an absolute MUST to have around anyway, but they are indispensable for traveling. They are trim and super absorbent and make a great no-fuss addition to your existing stash. While traveling, these are fantastic because you can lay them flat on the bottom of your suitcase without taking up too much space. The laundering is also easier, with bamboo, you don't really have to worry about the insert holding stink because it's naturally antimicrobial! Just make sure that you have properly prepped your bamboo insert BEFORE you travel! (For maximum absorbency wash and dry 7-8 times). What we love: Rumparooz Bamboo 6R Soaker. The softest, thirstiest insert out there. They come with an attachable newborn insert, which is a great addition to the regular insert for nighttime diapering or if you have a long flight. With the inserts attached to one another you have a total 7 layers of absorbency. Wow! A lifesaver when you're on the go! The bulk of the mess stays on the liner, making it easy to flush the waste down the toilet. Great if your baby has the “peanut butter” poop consistency. Washable liners are great to have if your baby’s bum needs a little diaper cream every now and then! You can use this as a barrier between your cloth diapers and diaper rash cream to keep your diapers (and your baby) in perfect condition. 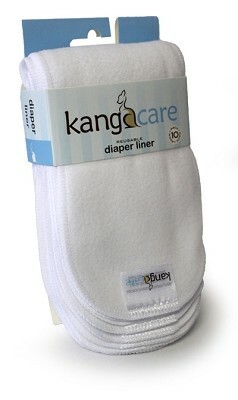 What we love: Kanga Care Washable Diaper Liners. Made with the same cloud-soft microchamois in a Rumparooz and great for babies! We are not talking a regular run-of-the-mill bargain basement wetbag...this has to be a great wetbag. You do NOT want to take the chance of anything leaking on your clean clothes, diapers, or worst yet, your suitcase. A larger sized wetbag, one that fits at least 10-15 diapers is ideal for travel because it is not too large to carry around, but it is large enough to accommodate lots of diapers! This way, you don't constantly have to take time out to empty the bag. Bring two, so that you always have a clean wetbag waiting while you are doing laundry or on the go. 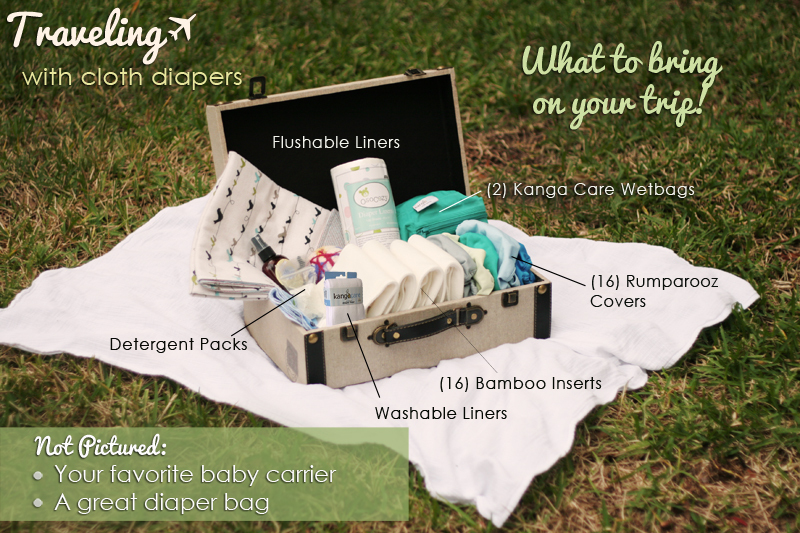 What we love: The Kanga Care wetbag has two features that are really excellent for traveling. 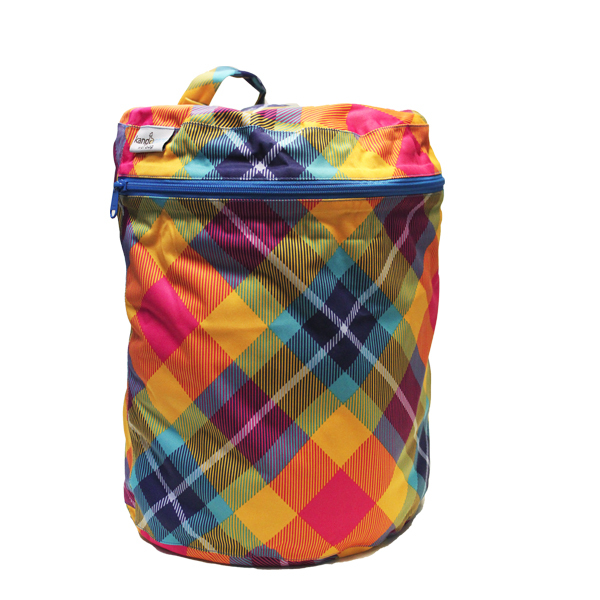 The 3-D design means the wetbag folds really small but fits up to 15 diapers and 15 inserts. The other great feature is the barrier-seam sealing. No odor, no leakage. This feature alone is worth its weight in gold for travelers. Pack pre-measured ziplock bags of your favorite cloth diaper safe detergent. (Remember: Kanga Care recommends original Tide Ultra, powdered Ecover or Gain.) Depending on your stash, you might need a special kind of detergent packed. Prepare the individual sandwich baggies with a single load portion of your detergent, one for every other day you plan to stay. For example, if you stay at your relatives' for 6 days, pack 3 pre-measured baggies of your cloth diaper detergent. Don't expect your relatives to have the type of detergent you need for your diapers! I live and die by my Petunia Pickle Bottom Boxy Backpack. Ok, that was a mouthful, but it's true. It fits all of my diapers, wipes, blankies and snacks. It also has an awesome feature, which is a built-in changing pad. I have used this bag to change my baby in the weirdest places! The pad folds back into the bag when you're done. It is ultra convenient. The fact that this bag can be worn as a backpack is also lifesaver, I can wear baby in the front and the Diaper Bag on the back. I might look like a mom-donkey, but hey, my hands are free! On my last cross-country trip, I wore my baby everywhere! What a difference it makes to have your hands free to get something to drink or chase around an older sibling. Wearing baby is also a great way to keep him/her calm during take-off or landing, and to keep baby close to your heart! Now, some of you will read this and think, “Hey, where are the disposable cloth diaper inserts? Those are great for traveling right?” Sure, they might be convenient, but please read up on the brand you're considering if you do decide to use these because they are not all the same! Among other non-biodegradable elements like plastic and elastic, they contain SAPs (super absorbent polymers) which have been linked to Toxic Shock Syndrome and were removed from tampons more than three decades ago. It pays to do a little research! If you are staying at a hotel, call ahead and find out what type of laundry facilities they have or what type of services they offer. The front desk may be able to move you to a room closer to those facilities. Some higher-end hotels will pick-up the laundry for you and wash it for a fee. If you are staying with relatives, the same advice applies there; call ahead to check if it's ok to use their washing machine for cloth diapers (some people are touchy about that). And don’t forget to check what kind of machine they have. If they have an HE machine, you might have to do extra cycles to get the diapers really clean and bring HE safe detergent. Remember, the point of any trip is to have fun! So don't spend time worrying about laundry! Use these tips to plan ahead so that when you’re on the road, you can focus on what is really important: spending time with your family and gorging yourself on yummy foods. Do you have any other tips you want to share? Tell us below! Great ideas! I haven't traveled yet with cloth diapers - I usually do disposables because I'm a little intimidated with cloth. But this really helps to break it down. Love the photos too. When we went out to California, we just used our disposable liners and that seemed to work out pretty well. When I went to my best friends house in Ohio, we took our diapers and washed them at her house. They are somewhat bulky and take up quite a bit of space though, so I think when flying, I will stick with disposable liners and covers for trips. This is perfect for my sister who has a 4 month old and is doing cloth diapers! Great post. Love these! 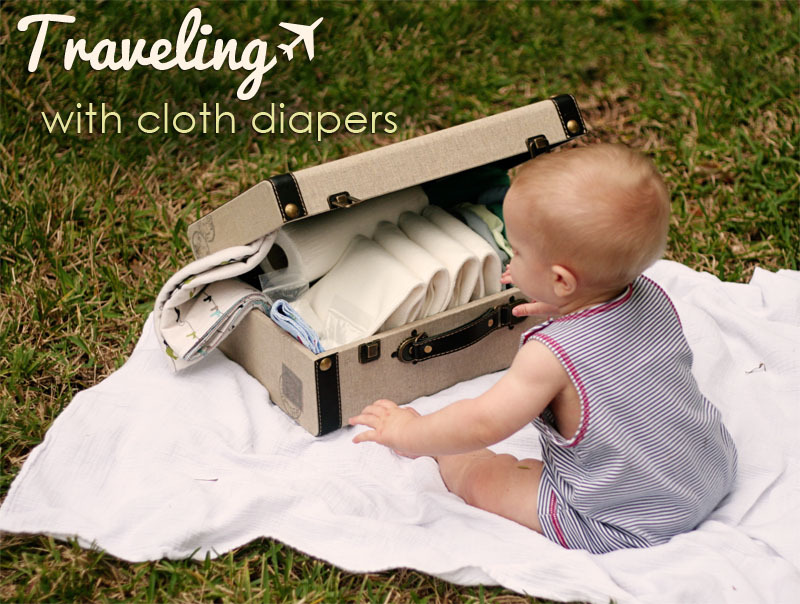 We've traveled both overnight and for longer week-long trips with our cloth diapers and have always had great experiences. I have never used cloth diapers but I am amazed at the cute designs. These tips are great and I will be sure to share this with my cloth diapering friends. Thanks. My sister is going to love this post!